Much has been done with making search more social. Bing has partnered with Facebook to bring Facebook-integrated search results. Google has made several algorithm tweaks to make localized and social results more relevant. Yet both of the major search engines’ social offerings seem to be lacking in some key areas. So far, neither search engine has found the right mix of dynamic, social results and the more traditional SERPs. It is also a challenge to find a social platform to make recommendations or social algorithm tweaks possible. The search engines need a warehouse of social data to pull info from. While much time and effort has been put into social search by the Big Two, another company has produced a far superior social search engine without even trying. Twitter’s primary function is to exchange bits of information with your social network, but this model has in turn produced a great search engine. 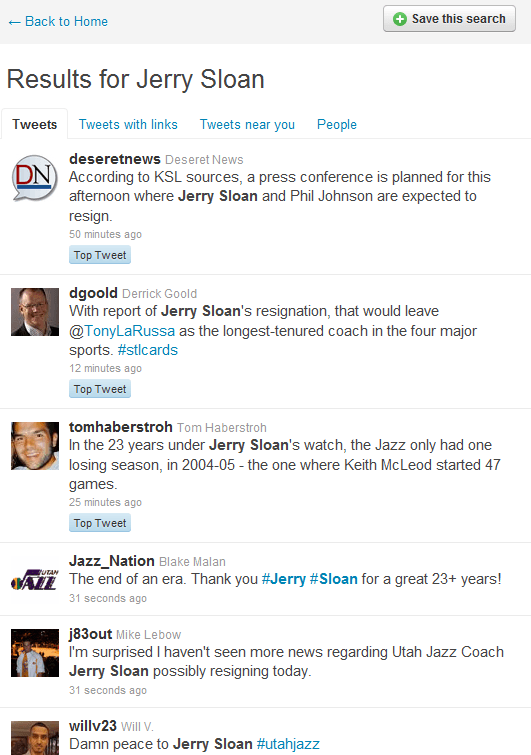 Like any good social search engine, Twitter indexes real-time results (tweets) from a variety of sources (Twitter users). You can pull in ‘results’ from a generous mix of sources including firsthand observers and experts, in addition to completely random Twitter users. Instead of going to Google and finding a bunch of static pages and a few newly published news articles, I’d rather head straight to Twitter to read on-the-fly commentary. It is amazing to me how similar the results are. Google’s algorithm is based on links while Twitter’s algorithm is based on ‘Retweets’, yet both push trustworthy, relevant information to the top. 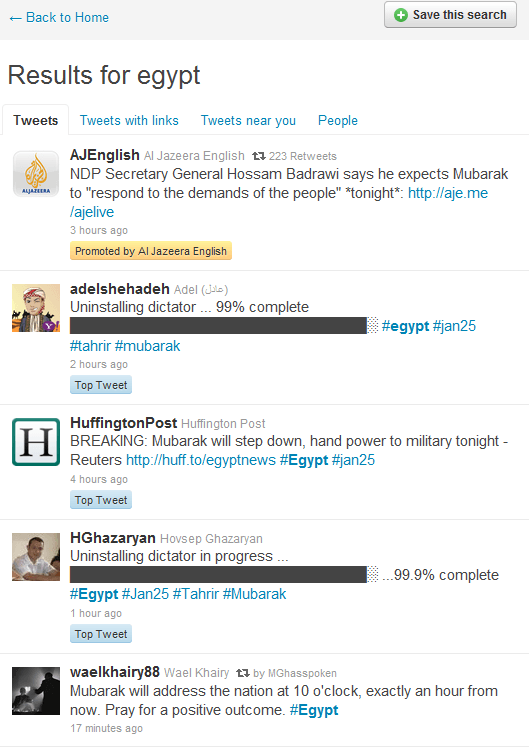 In this example, if you want to see what is happening in Egypt right now, Twitter’s results are much more useful. You have the latest and most important news updates at the top with humor, opinion and other thoughts being constantly updated below. 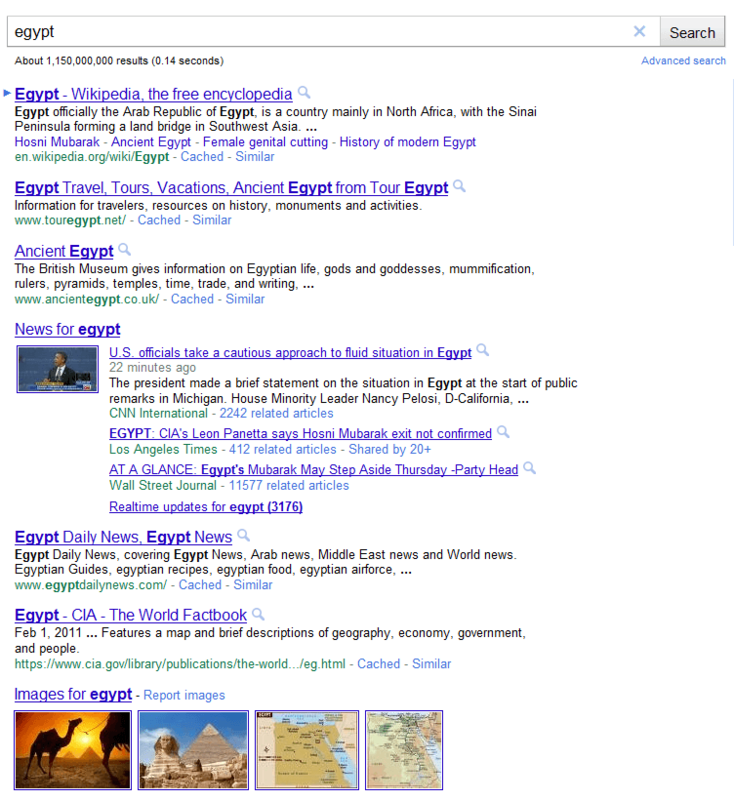 Google’s results are much more static despite the addition of recently published news stories. As a search engine, Twitter serves a much more niche purpose than Google does, yet is obviously less robust. But nevertheless, I’ve found myself turning to Twitter more and more recently, whereas I would have once turned to Google. The simplicity is refreshing and the large volume of updates coming in by the second is extremely powerful. McDonald’s recently began offering oatmeal on the menu and I’d like to see how it is. Instead of going to Google and filtering through a bunch of other pages that are not of interest to me, it is much easier to just search for “McDonald’s oatmeal” in Twitter and read what people are saying about it right now. 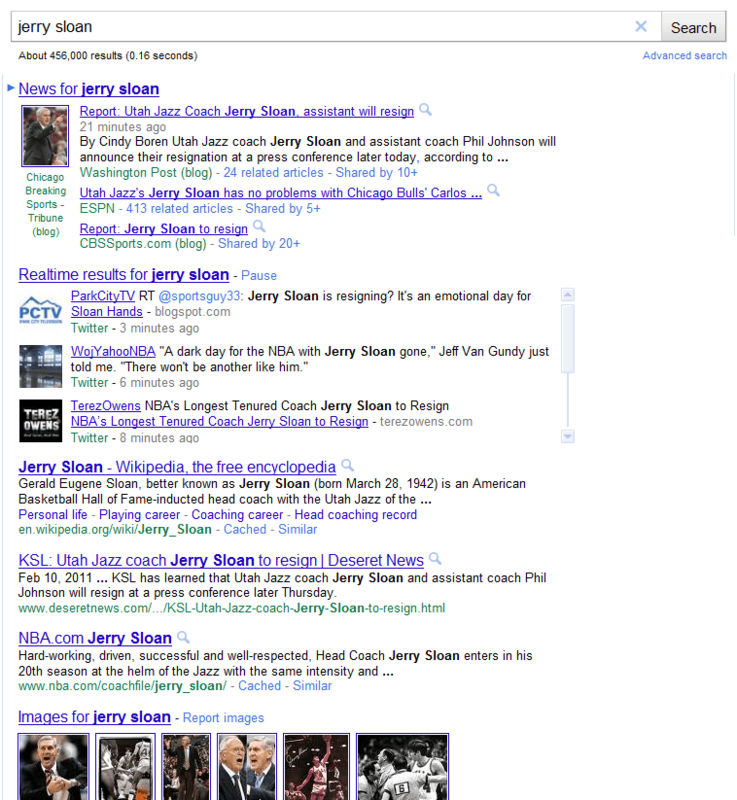 During a major news or sporting event, I used to search on Google for related blogs or forums to read live commentary. Now a single query in Twitter provides an up to the second glimpse of the world’s thoughts on any particular issue. This is interesting because Twitter isn’t designed to be a search engine. This functionality is a byproduct of Twitter. Yet it does a much better job at providing the elusive social search that Google and Bing have, generally speaking anyway, failed at for years. The inherent truth to take away from this is the importance of being engaged in the social conversation. Are you engaged?